Our cobalt xf chrome 6mm brush finish milgrain wedding band is a durable wedding ring which will not crush, twist, or bend. The ring is 6mm wide and made of cobalt chrome which is a metal alloy containing cobalt and chromium. Cobalt chrome is a very strong metal alloy and makes a great wedding band for those men who work with their hands or are very active. The cobalt xf chrome 6mm brush finish milgrain wedding band is the perfect wedding ring for those who like a more classic look in the style of jewelry they like to wear. 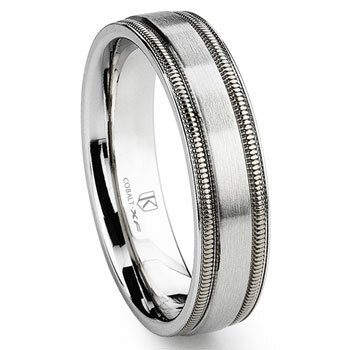 The milgrain running parallel on the surface of the wedding band add a touch of class to the ring. As with all of our jewelry we offer a 100% lifetime warranty. We carry a full line of cobalt, titanium, and tungsten wedding bands, as well as rings, earrings, necklaces, bracelets, pendants and earrings. This wedding band is the perfect ring for my husband. The original size we ordered was too large, but Titanium Kay quickly switched the size for us!! My husband loves this ring. Replaced his gold one with this as he is an engineer working construction sites frequently. Knowing that this ring is scratch resistant and yet as stunning as platinum made this an easy choice. Thank you for a fine product!